A new theatre company, set up to bring to life the stories your parents and grandparents repeatedly told you over the years – maybe now they'll shut up about them! When Donna discovers that her Dad has gone missing she tries to keep his struggling shop together as long as possible before anyone finds out. But with no clues to his whereabouts, it’s not long before she enlists the help of the town. With Louise her easily distracted co-worker, clumsy ‘Romeo’ Jamie the fruit and veg delivery boy and Derek, a pensioner with a motor mouth and a temperamental mobility scooter, Donna goes on the search for her missing Dad ‘Top Man’ Terry. Written after seeing so many shops closing down or empty on the high street and wondering about the people that owned them. 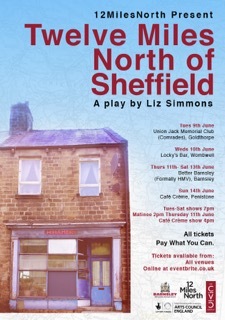 Twelve Miles North of Sheffield is a touching and funny play about family, friendship and trying your best. In June 2015 we took the play on a mini tour of South Yorkshire performing in a working man’s club in Goldthorpe, a pub in Wombwell, an empty shop in Barnsley and a cafe in Penistone. We plan to tour to studio spaces and high streets again in 2016.